We are coming to expect quality video in all our digital experiences – from online shopping to on the job training. However, as video technology has become more ubiquitous, it has also become more complex. To deliver a quality experience to users, regardless of their device and connectivity, you need a holistic video strategy. 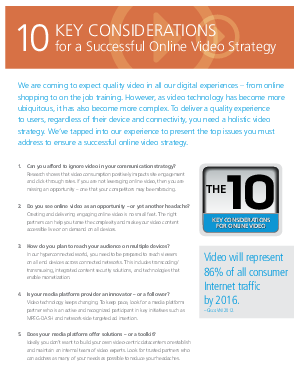 We’ve tapped into our experience to present the top issues you must address to ensure a successful online video strategy.